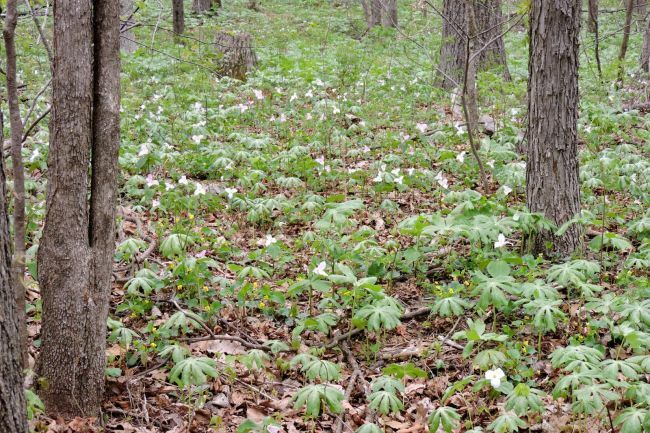 Great white trilliums, along with some other varieties, bloom en masse up and down the slopes of G. Richard Thompson Wildlife Management Area in northwestern Fauquier County, where the park lies along a stretch of the Appalachian Trail. We are planning our annual trek there to see them at the end of April this year. Our hike will be at a leisurely pace, as there is an interesting mix of plants in this natural community living alongside the trilliums, but the trail is somewhat rocky and steep at places. Again this year we will hold the hike on the day of the City Nature Challenge for the DC area, and we encourage you to join other citizen scientists by bringing a camera and uploading your pictures to the iNaturalist site. The site of our walk, the G. Richard Thompson Wildlife Management Area, is run by the Virginia Department of Game and Inland Fisheries. It lies on the eastern slope of the Blue Ridge Mountains and includes nearly 4,000 acres of hardwood forest, ranging from 2200 elevation peaks to terraced lower slopes. Thompson WMA trails wander past rock outcroppings, spring seeps, and several major streams. Alonso Abugattas is a well-known local naturalist, storyteller, and blogger. He is the Natural Resources Manager for Arlington County Parks. A former officer, including president, of the Potowmack Chapter of the Virginia Native Plant Society, Alonso is a master naturalist and master gardener, serving as an instructor for both, and he was a co-founder of the Washington Area Butterfly Club. He invites you to check out his Capital Naturalist Blog (http://capitalnaturalist.blogspot.com/), Capital Naturalist Facebook Group, YouTube Channel, and/or follow him on Twitter. However, this event has LIMITED SPACE, and you must register to attend.